This 2 bedroom, 2 bathroom completely furnished home is situated on a waterfront lot with an unobstructed view of the scenic Crystal Lake. 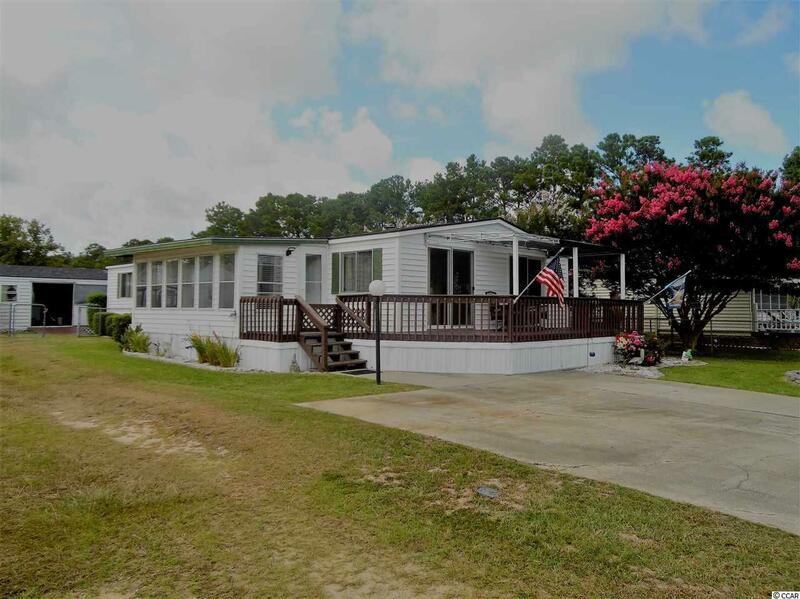 This mobile home village is located in the Prestwick, Ocean Lakes area of Myrtle Beach. Just a short golf cart ride away from the Atlantic Ocean and the Myrtle Beach State Park. The huge, raised deck on this home is perfect for sitting back and relaxing, grilling, entertaining, whatever you want to do while enjoying a comfortable breeze blowing in off the lake. Out back is a nice, fenced in back yard with not one, but two separate detached outbuildings, both with electricity. Big enough for a nice workshop and golf cart storage. Going around the back of the house is another deck located off the laundry room. The main door brings you into a sitting/TV room off the living room. Could be used as Carolina room with windows completely surrounding the room. When leaving this room, you enter into a large, open space that could be a double living room with a fireplace located on the far wall. The formal dining room separated from the living space with a beautiful spindle wall is located next to the kitchen on the lake side of the home. With a sliding glass door allowing direct access to the outside deck, this dining area features two built-in corner, china cabinets allowing for the storage of all your dishes and personal items. A very nice display upgrade. The kitchen has a newer, stainless steel side by side, refrigerator and 16 white cabinets that will store everything you need. This house offers so much! Going to the rear portion of the home are the two bedrooms. The master bedroom has an incredible private bathroom suite. It goes on forever. Double sinks and a stand-alone shower. Directions: Turn Off Of 544 Onto Prestwick Club Drive. Mobile Home Community Is At End Of Road At The Stop Sign.